This Verge3D release is out for both Blender and 3ds Max. Version 2.8 brings major improvements in the Puzzles editor, updates in the WordPress plugin, support for custom split nodes and several new Cycles nodes and upgraded code examples. Thanks to the feedback from our valued community, the Puzzles editor now offers the possibility to add more workspaces that are represented with tabs. The tabs will allow for better organizing your puzzles scenarios that sometimes can get really bulky. Tabs in the Puzzles editor make the Industrial robot demo more easily understandable. You’re now able to create and delete custom-named tabs, and add puzzles in them. To move a group of puzzles from one tab to another simply cut it first with Ctrl-X, switch to the other tab and paste with Ctrl-V. Procedures and variables are set to be global, meaning that they will be accessible/callable across tabs. We have introduced a new local transform puzzle that moves, rotates or scales an object in its local space rather than in world space. Some additional events were added to the dropdown of the HTML event puzzle, particularly event for handling touchscreen gestures. The Puzzles editor now properly work in Microsoft Edge browser. The when clicked puzzle now works for displaced & scaled canvases/containers. Fixed when hovered puzzle, the callback slot of which now correctly triggered when the mouse cursor is hovering over a group of objects. The Verge3D plugin was verified by WordPress developers and authorized for inclusion to the official WordPress plugin catalog. Fixed a bug in the WordPress plug-in when multiple .html files are present in a project folder. The uploads directory was separated from code to allow for proper plugin updates. Fixed some potential security vulnerabilities as per discussion with WordPress developers. Now, Verge3D apps load even if some textures are missing making them more fault tolerant. Annotations are now faded when obscured by geometry. [Blender only] Custom split normals are now exported. 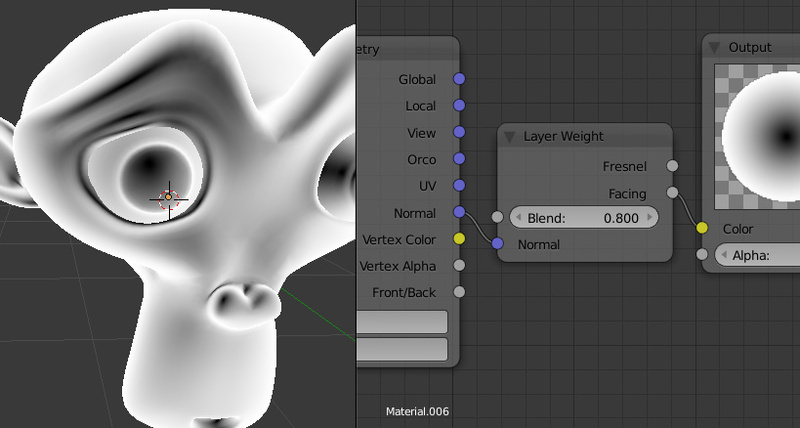 Edited normals allows an artist to create geometry of better quality and more compact for loading, all at once. Custom split normals allow for nicer and more optimized geometry. [Blender only] Layer Weight node from Cycles and Blender Internal is now supported which can be used for creating Fresnel-like effects. Layer weight node in action. Transparency Cycles node is now consistent with rendering. 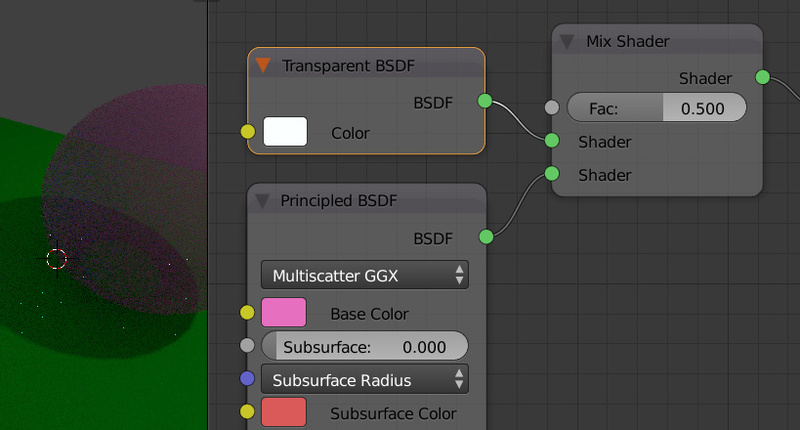 Transparency BSDF Cycles node used with the Mix Shader node. Rearranged the App Manager’s layout a bit – there is now a separate section for managing your directory on Verge3D Network. 300+ ready-to-use Verge3D examples which we ported from Three.js were moved out from the Verge3D distribution (which reduced its size by 100Mb) and deployed on Verge3D CDN. Each example supplied with a button to view the source code which was published on Github. The links to the examples were updated in the App Manager and the User Manual. Node materials API, including info on how to change material colors, values and textures – link. Fixed an iOS-specific bug when running within iframe with incorrect width resizing after phone orientation changes and after DOM content changes. [Blender only] Fixed script crash after reloaded with F8. [Blender only] Fixed a bug when objects with multiple armature modifiers did not have exported armature. [Blender only] Fixed a crash when exporting location animation if any of its channels are empty. 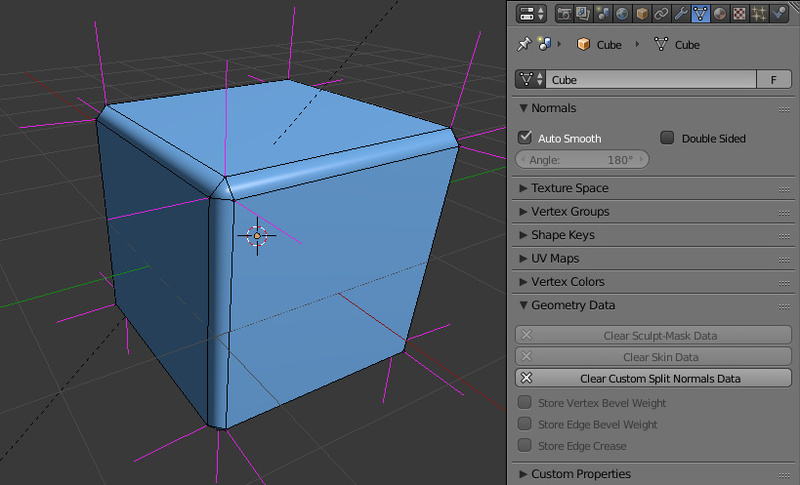 [Blender only] Fixed missing triangles when exporting complex geometry due to incorrect triangulation of n-gons. As always, feel free to leave your feedback here in the comments or on the forums! the fix to an issue with the camera rotation speed setting that was working incorrectly on mobile devices. Please upgrade only if the above changes are relevant to your apps, otherwise you can safely wait for the next release. The image on the front page obtained by applying a Layer Weight shader to the free model created by DarkLimit.